Two years after the release of Flanders Fields, their first album for Milan-based label AltrOck Productions, Belgian outfit Humble Grumble have made their comeback in the spring of 2013 with Guzzle It Up!. Though mainman Gabor Humble first established the band in 1996, Humble Grumble’s current incarnation dates back from very recent times, and is multi-national in nature – including, besides Hungarian-born Humble, Finnish bassist/keyboardist Jouni Isoherranen and Chilean reedist Pedro Guridi, as well as a number of Flemish musicians. The band also have quite a few festival appearances under their belt, and, around the time of the new album’s release, they performed at Gouveia Art Rock Festival in Portugal and AltrOck’s very own event in Milan, Italy. While emphasizing the continuity of the band’s sound, Guzzle It Up! also marks a departure from Flanders Fields, and not just in terms of lineup. In fact, when the previous album featured a core group of six people and an extended cast of guest artists, here the situation has been reversed: the eight-piece band – with Humble, Isoherranen, Guridi, saxophonist Pol Mareen and drummer Jonathan Callens joined by vocalists Liesbeth Verlaet and Megan Quills and mallet percussionist Joren Cautaers – handles all the tracks, and the contribution of guests is marginal. The rich instrumental texture of Flanders Fields has remained unaltered, with the clear-voiced lilt of the vibraphone providing a refreshing change from the usual keyboards, and the saxophone often engaging in dynamic duets with Humble’s guitar. The latter’s versatile vocals are complemented by the two female voices, their lively exchanges often bordering on endearingly wacky, and perfectly suited to the music’s overall mood. On the other hand, Guzzle It Up! is clearly more ambitious in terms of structure: while Flanders Fields was a collection of 11 remarkably short songs, here a shorter tracklist is compensated by running times that have more than doubled. With two out of 7 songs around the 10-minute mark, even the shorter tracks seem to have adopted a more leisurely pace than the dense, whirlwind-like numbers that made up the band’s previous effort. There are no instrumentals either, and a lot of emphasis is placed on the vocal interplay between Humble and his two female cohorts. 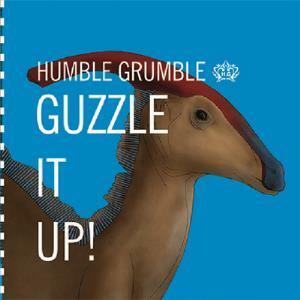 Humble Grumble’s more ambitious approach is introduced right from the start with the almost 10-minute“Kurt’s Casino”, a brilliant combination of upbeat, downright infectious melodies and the rather somber subject matter of suicide, propelled by Jonathan Callens’ spectacular drum work and Pol Mareen’s ebullient sax, and enhanced by vibraphone and marimba (the latter courtesy of former member Pieter Claus). The album’s longest track, “The Dancing Dinosaur”, gives a new meaning to the word “eclectic” by throwing a slew of diverse influences into the equation with carefree abandon – jazz inflections as well as the inevitable Zappaesque bent coexisting with catchy, almost poppy chorus, wistful sax section, an atmospheric guitar solo and an unexpected, galloping hoedown towards the end. Driven by Callens’ pyrotechnic drumming, “The Little Man” suggests Samla Mammas Manna’s carnival-like zaniness; “The Campfire Strikes Again” strays even further into Zappa-meets-RIO-meets-Gong territory, seasoned with a pinch of dissonance and the vocalists’ striking repartee. Vocals (including rapping) and assorted wacky sound effects are the foundation of the off-kilter “Accidentally in San Sebastian”, while “Skunks” (whose lyrics that would make Frank Zappa quite proud) pulls out all the stops, with Humble’s exaggerated falsetto and chaotic vocal “harmonies” that sound like a skewed version of Gentle Giant, a wild guitar solo and hints of Eastern European folk. “Pate a Tartiner” wraps up the album in suitably eccentric fashion, also introducing an appealing funky note to complement the ever-present Gong and Zappa influences. Clocking in at a very restrained 44 minutes, Guzzle It Up! is as much of an acquired taste as its predecessor – possibly even more so. Though the quality of the individual performances is outstanding, and the sheer joy of making music refreshingly evident, its abrupt changes in mood and style can strike some of the more mainstream-oriented listeners as inconsistent and even frustrating, and the wacky, anarchist humour of the lyrics can be occasionally hard to take for those who prefer a bit more subtlety. On the other hand, fans of Zappa, Gong and the Canterbury scene will not fail to appreciate the album and its ambitious direction. The photos in the CD booklet and on the band’s website clearly point out that Humble Grumble belong on the stage, and that the studio format must be somewhat constraining to them. Highly recommended to any open-minded progressive rock fans, Guzzle It Up! may not be an easily approachable album, but is definitely an intriguing one.